Google Assistant, the personal AI assistant found in Google Home, has learned a few new automotive-related tricks as we begin 2017. No, it can’t drive itself –yet– but, it can now communicate with any Hyundai vehicle that’s equipped with Blue Link, the company’s impressive proprietary infotainment setup. Blue Link customers must first authenticate their accounts with the Google Home app, then a handful of new commands will be available to use from the comfort of your home. The list of interactions isn’t wildly imaginative, but impressive nonetheless, covering the essentials, like “OK Google, find me a good Chinese restaurant”, or “OK Google, tell Blue Link to send that address to my Santa Fe”. Those who don’t like stepping into a cold or hot car will be pleased to know that there’s an interaction to start the car and set the temperature to your liking. 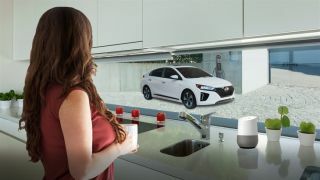 Check out the full list of commands that will work between Google Home and Hyundai Blue Link right here. Of course, security is ever important, so the Hyundai team implemented a safety measure to request your Blue Link PIN to ensure that only you can chat with your car. More connected devices, including cars, are sure to be added to Google Home’s arsenal soon enough, but this addition puts it above the likes of the Amazon Echo.